The Tommy Hilfiger x Gigi Hadid Fall 2017 is a rebellious take on ‘90s heritage. It’s the brand’s vision of modern Americana where youth culture and grunge meet prep. Think tradition with a street style twist, statement-making tartans, unexpected proportions and salutes to athletic and skate. Welcome to the ROCKCIRCUS. “Gigi and I wanted to make this season feel glamorous and a little bit daring, and we really had fun with the designs. I’ve always believed Gigi to be a fashion icon, and with this third capsule collection, she blurs the boundaries between fashion and rock-and-roll,” Hilfiger says in a statement. 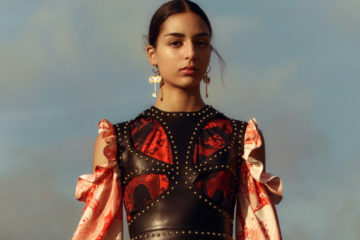 The capsule, which features women’s sportswear, footwear, and accessories— including watches and sunglasses— premiered during the designer’s see-now-buy-now runway show during London Fashion Week. The offering features a selection of need-it-now pieces that take inspiration from the ’90’s Rock’n’Roll style and plays with oversized proportions, high-shine leathers, denim, and flannel. Shop the interactive lookbook as you hover over the items of interest and review the details to purchase online.